Oh, how I wish I knew how to read tea leaves. After opening my tea bag, plunking it in my cup and covering it with boiling water, I turned over the tag to read these three simple lines of inspirational text. 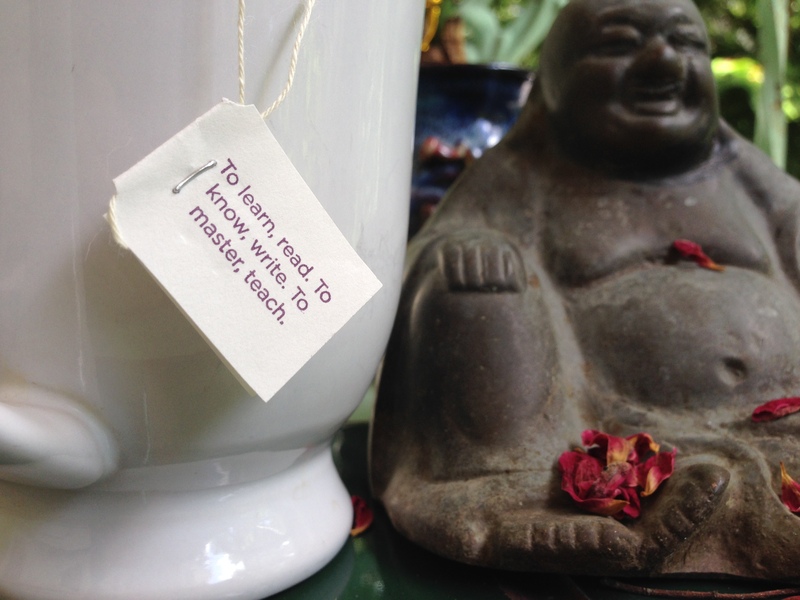 Sipping my tea quietly put me in mind of how teaching others is the best way to learn. Maybe the tea leaves would reveal that I have always loved teaching because I love to learn. I love yoga and I love teaching yoga. And now teaching yoga is teaching me. Malcolm Gladwell goes through many formulas for achievement in his 2008 book “Outliers – The Story of Success” but it’s his 10,000 hour rule that stuck with me. He says that it takes at least 10,000 hours of doing something before a person gains true skill. Teaching motivates me to put in the time so that I might master a subject. After all, one should feel very confident in their understanding of something before they try to teach someone else. In order to know something thoroughly you have to read, write and practice. That takes time. Teaching gives you bonus hours once you’ve become competent enough to spend time passing knowledge on to others. Teaching also has the effect of making you feel like you’ve earned back much of the time invested, especially when the light bulbs burn brightly over your students’ heads. I’m confident that I have put in over 10,000 hours doing yoga poses (asana – one of the 8 Limbs of Yoga) but I certainly would not say I have mastered asana. For the other seven limbs of yoga quick math tells me that if I spend an hour a day everyday for nearly 28 years I’ll make the required 10,000 hours. Quick psychology tells me 10,000 hours of teaching yoga would remind me that I’ll remain forever a student! Many traditions would say that the moment you think you’ve mastered something you’ve just hit the 10,000 hour reset button that puts you back at the beginning.